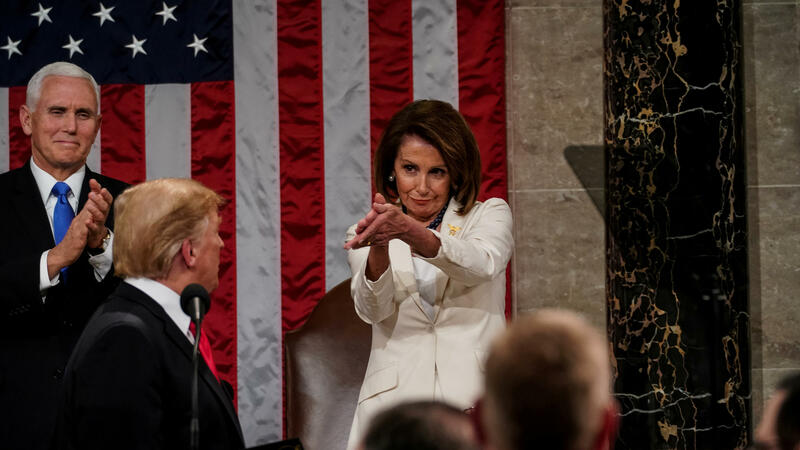 Speaker of the House Nancy Pelosi reacts to a comment by President Trump during his State of the Union address on Tuesday. 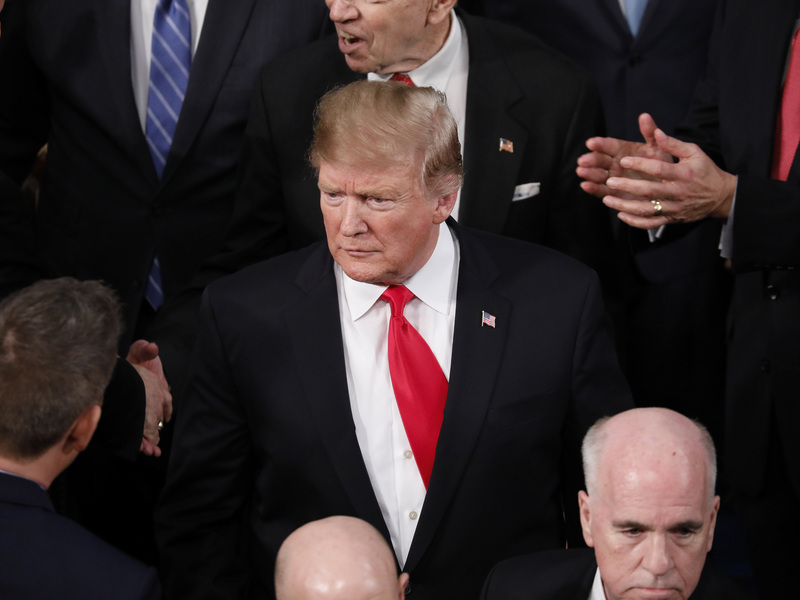 President Trump's State of the Union speech can be measured in a number of ways: length (it was the longest such speech in almost 20 years); content (Trump predictably focused much of the speech on immigration, while also announcing a date and time for his next meeting with North Korean leader Kim Jong Un); and, maybe most fittingly, the visuals. From Nancy Pelosi's applause to children nodding off on a school night to a historic first, here are the most important sights from the 96th State of the Union message. The hands-down most viral moment was between Trump and Speaker of the House Pelosi, and it came close to the beginning of Tuesday's State of the Union. "We must reject the politics of revenge, resistance, and retribution and embrace the boundless potential of cooperation, compromise, and the common good," said Trump before turning around and nodding to Pelosi, who was clapping, rather pointedly, at the president. Reps. Alexandria Ocasio-Cortez, D-N.Y. (third from left), high-fives Nydia Velazquez, D-N.Y., as Democratic members celebrate in the House chamber after President Trump recognized their achievement of electing a record number of women to Congress. 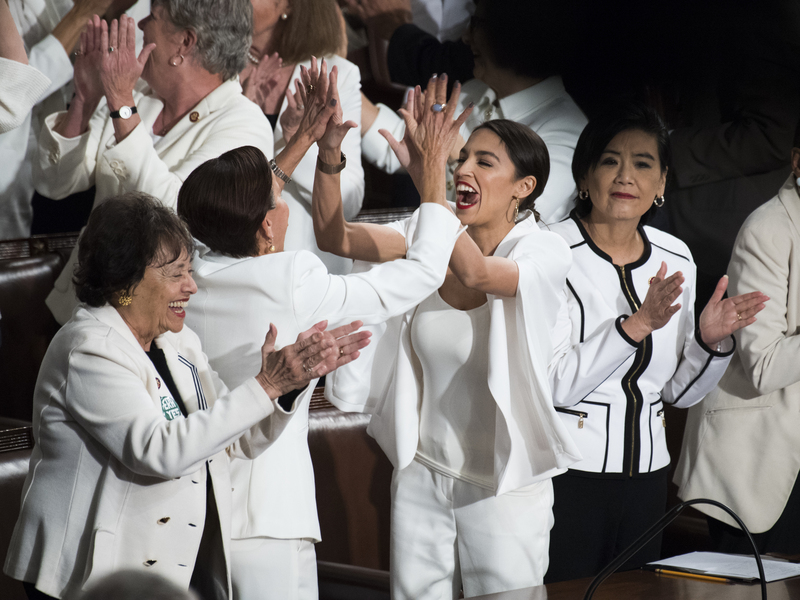 Democratic women wore white to Tuesday night's address, a showing of unity made more effective by the fact that there were simply a lot of women there. There are 127 women in Congress this session, the most ever and up from 110 in 2018, as reported by NPR's Danielle Kurtzleben. After Trump highlighted that fact, women in the crowd, led by the white-wearing Democrats, began chanting "USA! USA! USA!" "That's great," Trump responded with a smile. "Very great. And congratulations." President Trump's tie was off-kilter as he entered for Tuesday's speech. President Trump entered the House chamber wearing a tie that would not fall into place. Moments passed. And passed. And passed. The red tie seemed destined to live beneath his left lapel. "The state of the president's tie is askew," tweeted AP reporter Jonathan Lemire. By the time Trump had to speak to millions of Americans, the tie had worked itself out. It's not the first time his neckwear has been a topic of conversation. 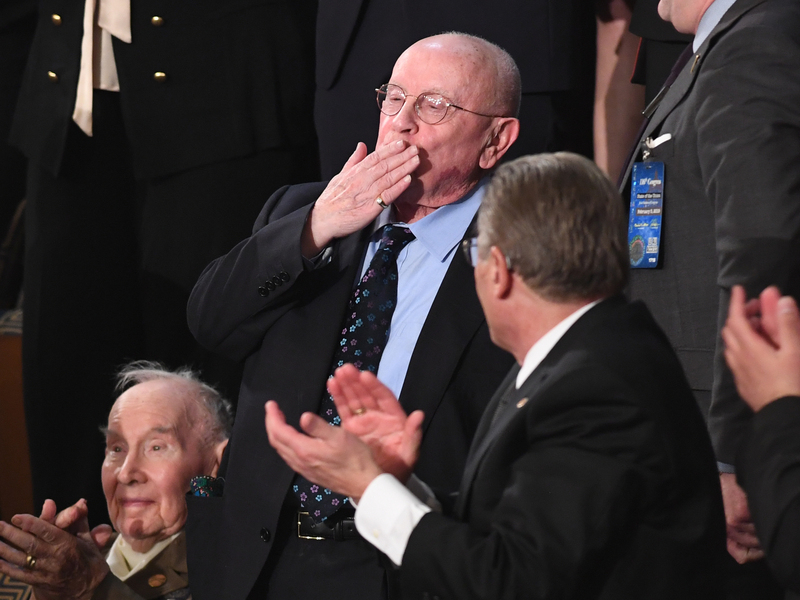 Special guest Judah Samet, a survivor of the Tree of Life synagogue shooting, blows a kiss as he is acknowledged during the State of the Union. Maybe the most genuinely moving moment of the evening came when Trump introduced Judah Samet. "Today is Judah's 81st birthday," Trump said, after explaining that Samet had survived both the Holocaust and last fall's shooting at the Tree of Life synagogue in Pittsburgh. The audience began a murmured melody that quickly turned into a full-throated "happy birthday" serenade, complete with conducting from Trump. "They wouldn't do that for me, Judah," Trump noted after the song. First lady Melania Trump with special guests Grace Eline and Joshua Trump. As previously mentioned, the State of the Union was lengthy. It was the longest such address since Bill Clinton's 2000 speech, and the third-longest of all time. 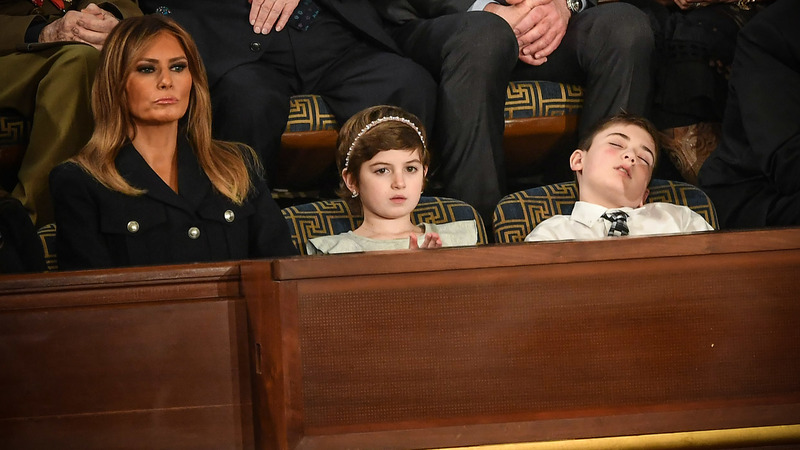 If children, such as the above-pictured sixth-grader Joshua Trump, will continue to be invited in the future, Congress may want to consider furnishing cots in the House chamber. 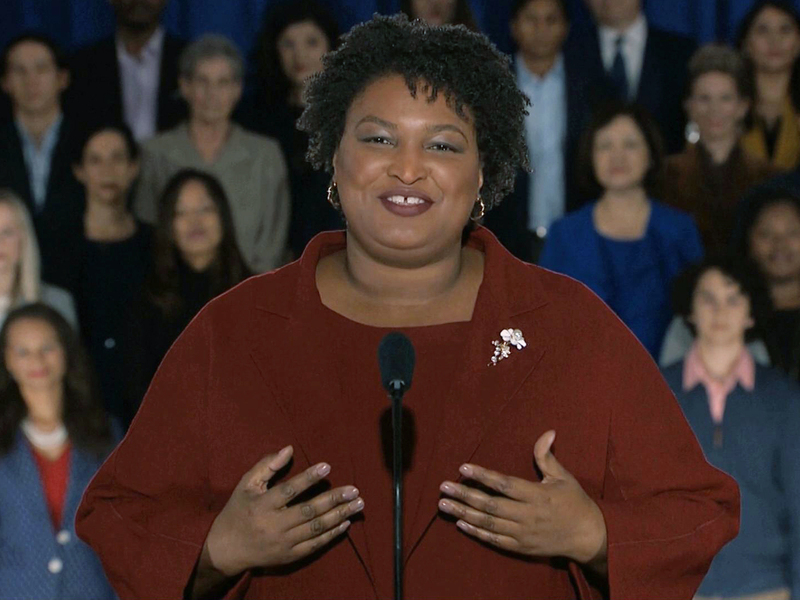 Stacey Abrams is a rising Democratic star who narrowly lost her bid to become the nation's first black female governor last year. She did, however, become the first black woman to give the State of the Union response on Tuesday night. She is currently being courted to run for the Senate in Georgia in 2020. Jamie Harrison, the associate chair of the Democratic National Committee, told NPR's Scott Detrow before the midterms that the attention Abrams has received over the past year didn't surprise her "at all." "I think she has come up with a recipe for success and a model that many other Southern states can replicate and follow going forward," Harrison said. "And I think, in that, it puts Georgia squarely in the column of a battleground state for the 2020 presidential election."